Auckland Aces 2-123 (Azhar Mahmood 55*, Martin Guptill 38, Chris Wood 1-21) beat Hampshire 8-121 (Michael Carberry 65, Sean Ervine 16, Azhar Mahmoud 5-24) by eight wickets. Hampshire scored 121 runs for the loss of eight wickets in the scheduled 20 overs. Auckland thrashed 123 runs with eight wickets in hand and 33 balls to spare. Azhar Mahmood (Auckland) was declared ‘Player of the match’ for his excellent all round performance. He grasped 5 wickets for 24 runs, that was his career’s best performance with the ball and he remained unbeaten for 55 runs. The qualifying match of Pool 1 in the Champions League Twenty20 was played at SuperSport Park, Centurion, on Wednesday, October 10, 2012. Gerath Hopkins, the captain of Auckland, won the toss and opted to field first keeping in view his team’s bowling strength. Hampshire opened the innings with Michael Carberry and James Vince in a typical T20 style by getting nine runs in the first over with a six from the latter. Vince hit 1 six and 1 four in the coming overs but lost his wicket for 11 runs as Azhar Mahmood struck twice in that over. Hampshire was 2-23 in four overs as Shahid Afridi became the third victim of Azhar Mahmood without scoring any run after the addition of five runs to the total. Sean Ervine joined in next with Carberry, both tried to mend the damage and the first fifty was attained in the 11th over. They enhanced the score to 64 in 12 overs as Ervine lost his wicket for 16 runs. Michael Carberry displayed a fine innings as the wickets kept on tumbling from the other end at regular intervals. He achieved his 11th T20 fifty in the 18th over and was dropped by Azhar Mahmood at his own bowling for 56 on the last ball of the next over. Carberry remained unbeaten for 65 off even balls with 1 six and 8 fours as Hampshire was restricted to 121 with two wickets in hand when the last ball of the 20th over was bowled. Azhar Mahmood was the most furious bowler and grabbed five wickets, Ronnie Hira held two and Michael Bates claimed one wicket. Martin Guptill and Lou Vincent started off cautiously as the latter was dropped on the last ball of the third over at seven runs by the wicketkeeper Michael Bates off Dimitri Mascarenhas. Guptill opened up in the next over by adding 15 runs with 1 six and a couple of fours. Vincent joined him in the following over by dispatching 3 fours but lost his wicket on the fourth delivery of the sixth over for 19. 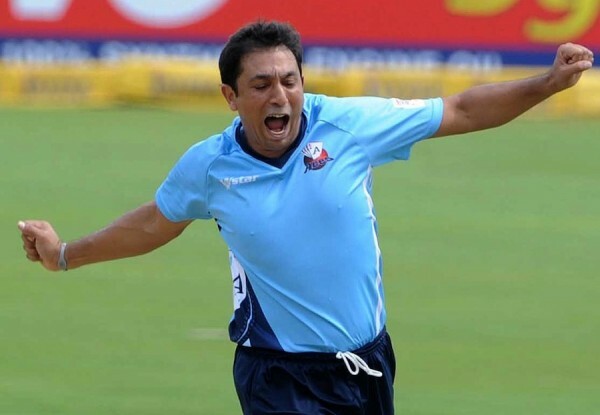 Azhar Mahmood associated with Guptill and they accumulated 14 runs in the eighth over with 2 sixes. Azhar had some different plans in mind and hit two sixes in the 11th over bowled by Liam Dawson. The duo added 41 runs in 33 balls and took the score to 90 in 11.1 overs as Martin Guptill was caught by Kabir Ali off Shahid Afridi for 38 scored from 31 balls with 2 huge sixes and 3 fours. Azhar Mahmood stole the show single handedly and hit 2 fours in the 13th over as first hundred of the innings was also displayed on the board. He smashed his 12th T20 half century on just 29 deliveries with a massive six on the last ball of the 14th over. Azhar Mahmood stood firm at his crease by scoring 55 runs off 31 mere runs with 4 giant sixes and 5 fours as Auckland hammered 123 runs for the loss of just two wickets in 14.3 overs. Auckland Aces won the match in a commanding manner with a galactic margin of eight wickets and have qualified for the Group Stage by winning both their pool games.